We’ve tackled pâte à choux in the past with éclairs and gougères — plus copious amounts of whipped cream, layered with chiffon cake and strawberries here — but I probably should have started with these. 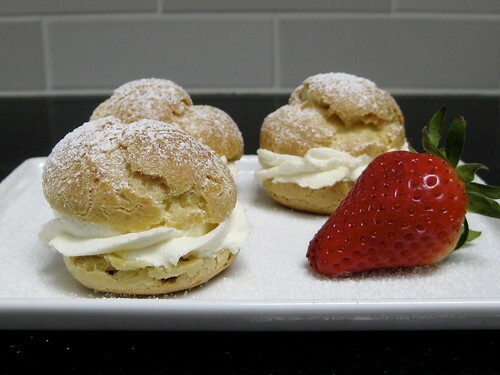 See, cream puffs are the simplest sweet application of the deceptively easy-to-make[-harder-to-pronounce] choux pastry that I know of, a good way to try your hand at a French classic. Plus they’re delicious. So anyway, downsizing them to two-bite pastries makes them far more manageable to eat politely — and mindlessly — while retaining a touch of the classic messiness thanks to the squishy-yet-pert fluffy cream centers. I highly recommend serving the cream puffs along with a bowlful of strawberries — a sure way to coax a little bit of early spring feeling out of the final weeks of winter — they’re the perfect accompaniment to swipe up any whipped cream spills. Feel free to double the recipe, but be sure to rotate baking sheets about half way through. Place oven rack on the center level, preheat to 375°F. Line a large, rimmed baking sheet with a silicone baking mat or parchment paper; set aside. In the bowl of a stand mixer, whisk together millet flour through Kosher salt. In a small saucepan (2-quart) over medium-high heat, combine water, milk and butter. Warm, stirring constantly, until butter melts and mixture comes to a simmer. While pan is still on the heat, add the flour mixture to the hot water mixture; stir with a wooden spoon until it forms a smooth, stiff paste (about 1 minute). Remove from heat and scrape the dough into the stand mixer bowl that held the flour. Break one of the eggs plus the vanilla extract into the paste, beat on medium-high speed (with the paddle attachment) until it’s smooth and kind of sticky looking (takes a couple minutes). Scrape down bowl, break the remaining egg into the paste, and beat again until blended, thick and sticky (this is what it should look like). Spoon small, level cookie scoops (1 tablespoon) of paste onto prepared pan, spaced about 1 1/2 inches apart. Place pan in oven and bake at 375°F for 25 minutes, then reduce heat to 325°F and bake for up to 5 minutes more, or until nicely browned and somewhat dry on the inside. Remove from oven and transfer puffs to wire cooling racks. Once cooled completely, cut each — a serrated knife works well — in about half (or 1/3 bottom, 2/3 top) and proceed to filling. Whip cream until it holds soft peaks. Add powdered sugar and extract; continue to beat until stiff peaks form. Fit a 12” pastry bag with a Wilton 1M pastry tip (no coupler required). Fill with about half of the whipped cream. Holding bag perpendicular to bottom of puff and about 1/2″ away from surface, pipe a generous, slightly domed swirl of whipped cream (a few tablespoons). (Note: or simply dollop whipped cream with a spoon on top of each.) Top with other half of shell, pressing gently to adhere. Repeat with remaining shells and whipped cream, refilling pastry bag as needed. Refrigerate until ready to serve, dusting with additional confectioner’s sugar immediately beforehand (if desired).